The cool thing I love about farmhouse style furniture is that even if you tend to gravitate more to the contemporary side of the furniture spectrum, you can easily incorporate subtle hints of farmhouse style furniture elements into your living space without completely making your home life "farmy." Take a look at what Interior Designer Nathan Kyle of Canadian Astro Design Centre did with this home on the river. I am simply in love with this farmhouse style kitchen island. Kitchen islands tend to be a huge focal point in the kitchen simply because it serves as the command center to so much action. It's important to select an island that doesn't force you to sacrifice style for functionality. This island blends the best of both worlds. 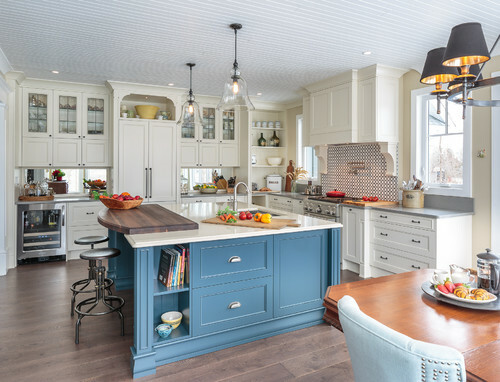 Not only does it's beautiful blue hue provide a sense of calm and character to the entire kitchen, it also provides shelves for cookbooks, hidden storage, drawers that fit pots and pans, a recycling station, a sink, a dishwasher and a microwave drawer. What more can you ask for. If you are starting to take an interest in Farmhouse Style furniture, you can easily do so in easy steps by simply incorporating farmhouse style elements to your home in order to provide a nice contrast and bring a sense of warmth to a home. 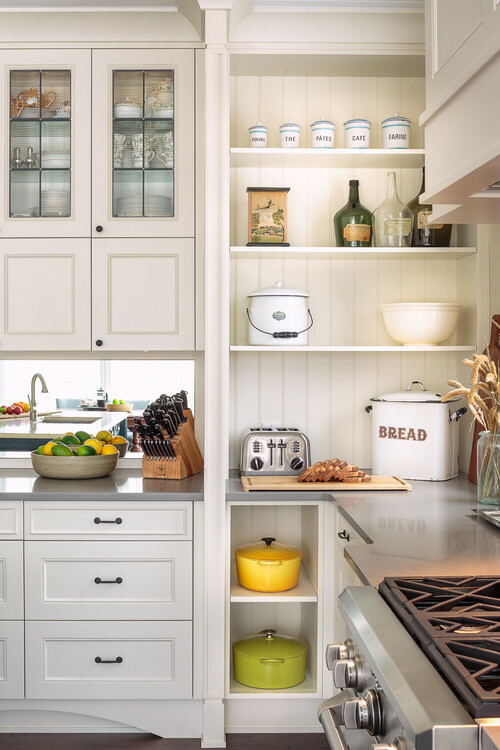 Elements such as a kitchen island or even a small area of beadboard placed on the wall can do wonders for the area. What types of farmhouse style elements have you begun to add to your home? Leave a comment and share. Hello! I'm Robert Chapman and I am a woodworking entrepreneur who loves all things wood. I current design and make Farmhouse Style furniture from dining tables to coffee tables and more. Farmhouse Signature is a designer and manufacturer of farmhouse, shabby chic, cottage style dining tables, coffee tables, end tables, dressers and more. We are home to the patented design Hybrid Farmhouse Dining Table.